Emma Henare (front, third from right in yellow) said the Zynergy Mega Crew provided her with a great opportunity to learn hip hop, have fun and make friends. It's a busy life for a young dancer and Emma Henare can testify to that. Within three days Henare, 14, completed jazz exams, performed at the NZCAF National Schools Hip Hop Championships and competed at DanceNZ Made. 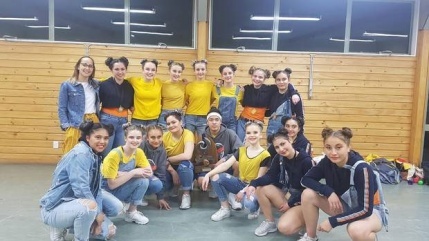 The highlight for the Whanganui High School student was winning the national title with the Zynergy Mega Crew, who were also named the best overall. Students Rebekah Phillips and Lauren Phillips were also a part of the Zynergy Mega Crew. "I really enjoyed it, I just got in the zone, had so much fun and it was a big buzz with all the people there cheering us on," Henare says. "Being named the best was unexpected, we didn't realise we would get that and it was a big celebration afterwards." The Zynergy Mega Crew is made up of students from High School, Girls' College, Cullinane College, Rangitikei College and City College. That includes dancers from Aotea Empire, who defended their status as national champions at the event in Lower Hutt. Zynergy members were selected through an audition process, they spent hours practising in the City College dance studio guided by Pauline Hiroti and Baillie Edwards. "They were amazing, they made the whole dance up and they put so much time and effort into it. They didn't have to, but they did," Henare said. "After the competition, Pauline said that we're now on the map and we're the people to beat because we've achieved this title and stepped up our game in Whanganui." It was the first year that the competition has allowed a mega crew to be formed with students from any school. "At high school we don't have a hip hop group, which means that this mega crew gave everyone in the city a chance to learn hip hop, have fun and make friends," Henare said. "At the dance competition the next day, we seemed to be a lot more supportive of each other and we were cheering each other on. "If the hip hop competition didn't happen, schools would still be divided and we might not have talked to each other." Henare is enrolled in the Sharyn Underwood School of Dance, she has a jazz and ballet background, but enjoys trying out new genres. "Hip hop dancing has a different kind of energy to it, it's a lot more raw and a lot more popular than other styles," Henare said. "On television, the majority of dancing is hip hop which means a lot more people enjoy watching it because they've seen it before." Following her success with Zynergy, Henare would like to see hip hop dancing implemented in her own school. "It needs to be pushed because we have quite a few dance competitions around like DanceNZ Made which is an opportunity for anyone to choreograph. "It can easily be organised, people just have to take the time to do it."